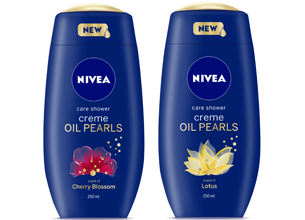 The innovative NIVEA Care Shower Creme Oil Pearls provides the perfect balance between intensive skin care and pampering moments for your senses – with two delicate fragrances – Cherry Blossom and Lotus which envelop your senses and take you to a world of luxury and indulgence. What a great product. Relieves any itchiness and absolutely smells delicious. I use it in combination with my Shower Cream as well as Nivea Body Cream. Devine !! I am a Nivea fan. This new range has me feeling so great about my skin. My super sensitive skin also thanks me. Nivea products have always had great products at perfect costs. Winter has left my skin dry and itchy. I will absolutely be trying this out.